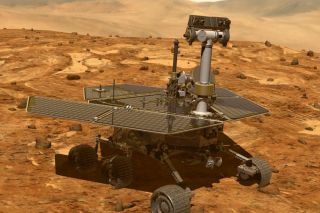 NASA declared its Opportunity Mars rover dead today (Feb. 13), more than eight months after the solar-powered robot went silent during a raging dust storm on the Red Planet – and a day after the final calls to wake Oppy up went unanswered. Opportunity roamed the Martian surface for nearly a decade and a half, covering more than a marathon’s worth of ground and finding conclusive evidence that the Red Planet hosted large bodies of liquid water in the ancient past. The golf-cart-size rover and its twin,, also helped bring Mars down to Earth, in the minds of scientists and laypeople alike. Both rovers then embarked on surface missions designed to last for about 90 Earth days, during which they hunted for signs of past water activity. Such evidence had previously been spotted from above – by NASA’s Viking 1 and Viking 2 orbiters, for example, which photographed what appeared to be ancient river channels on the Red Planet’s dusty surface. But Opportunity nailed it down. Data the rover gathered during its extensive travels also showed that “we’re not just talking about a puddle or a pond, but at least kilometer-scale bodies of water on the surface of Mars,” he added. And Opportunity’s analyses of clay minerals on the planet’s surface indicated that at least some of this ancient water, which flowed between 4 billion and 3.5 billion years ago, had a relatively neutral pH. That is, it wasn’t overly acidic or basic. “So, I’d say the rover established the physical habitability of Mars at the time life started on Earth,” Callas said. “Spirit’s contributions and discoveries were every bit as significant as Opportunity’s,” mission scientific principal investigator Steve Squyres, a professor of physical sciences at Cornell University in New York, told Space.com. Later missions confirmed and extended such findings. For example, NASA’s Curiosity rover has determined that the 96-mile-wide (154 kilometers) Gale Crater hosted a long-lived, potentially habitable lake-and-stream system about 4 billion years ago. Spirit finally got bogged down in a sand trap in early 2010. As a result, the rover couldn’t reorient itself to catch the sun during the approaching Martian winter and essentially froze to death. Opportunity avoided such pitfalls for eight additional years, studying rocks on the rims of four different craters, as well as the Meridiani Planum flats. The rover put 28.06 miles (45.16 km) on its odometer during these travels – more than any other vehicle, robotic or crewed, has traveled on the surface of another world. Then came the dust storm. In late May 2018, NASA’s Mars Reconnaissance Orbiter saw a storm brewing near Opportunity’s locale, on the rim of the 14-mile-wide (22 km) Endeavour Crater. The maelstrom grew quickly, engulfing the rover and eventually spreading to enshroud the entire planet. The thick, sunlight-blocking dust prevented the rover from recharging its batteries, and Opportunity went into a sort of hibernation. And it slept without being able to fire up its onboard heaters – a dangerous proposition on frigid Mars, where temperatures can drop enough to break soldering joints and other important pieces of internal hardware. Something bad apparently did happen: Opportunity hasn’t made a peep since June 10. “Opportunity likely experienced a low-power fault, a mission clock fault and an up-loss timer fault,” mission team members wrote in a December update. “We needed a historic dust storm to finish this historic mission,” MER deputy project scientist Abigail Fraeman, of JPL, said during today’s event. The dust storm started to die down in late July, and by mid-September it had abated so much that NASA began a concerted effort to rouse Opportunity. This “active listening” campaign involved sending commands to the silent rover and listening for any peeps it may have made on its own. It was important to continue this campaign for several months, NASA officials and rover team members said, because the windy season in Opportunity’s locale began in November. The hope was that strong breezes would clean some of the dust off the rover’s solar panels, allowing Opportunity to recharge its batteries and wake up at long last. This has not happened, however, and it apparently never will. So, for the first time in 15 years, we’ll just have to get used to a world – or two worlds, rather – without Opportunity.